It was a busy Friday night for Eddie Wineland (Pictured). Not only did the UFC bantamweight leave Florida with a knockout victory over Scott Jorgensen, but Wineland also took home 15 stitches to close the gruesome gash on his forehead. 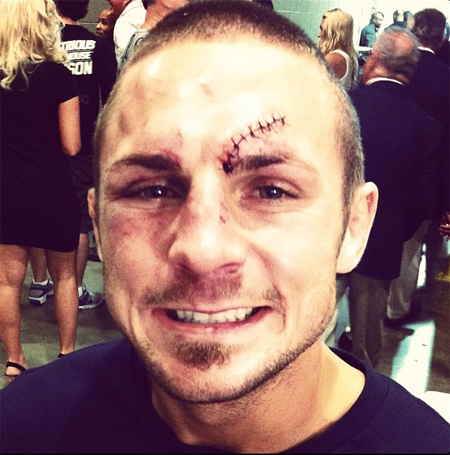 Despite the wound, Wineland was in good spirits as he and the UFC posted images of the new railroad tracks on his face. Wineland floored “Young Guns” with a vicious right hand in the 2ndRound of their 135-pound affair. After a couple of shots on the ground, Wineland was circling the Octagon and celebrating his first career big league victory. The night got even better for the 27-year-old when he hit the locker room. Wineland will also be leaving the Sunshine State with an extra $40,000 for ‘Fight of the Night’ honors. Jorgensen scored the same bonus check for his part in their scrap. “UFC on FX: Johnson vs. McCall II” took place inside BankAtlantic Center in Sunrise, Florida.